CLOSED - possibly permanently and rumoured to be converted to flats. Damn I missed a visit to a new pub by a month. I was in the area for a work thing so brought a few colleagues here at 10pm on a Wednesday evening for a couple of drinks. My first visit here since June 2014 and before that I hadn’t been for a long time. 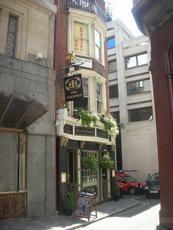 3 ales on the taps, my choice of Andwell Brewing Co’s King John @ 4.2% was very drinkable. A tiny but comfortable pub, me & a few others enjoying the ambience. Not for long however, a multi national selfie stick wielding mob swarmed in, overwhelming the space but not it seemed the staff. Used to it I suppose. My pint of Truman Swift (£4.00) was not bad but I quickly necked it & scampered. I worked opposite this place in the late 90's and only visited once so a return was long overdue. Popped in on a Friday evening when the sun was shining and it was busy with an after work crowd. Nice little traditional pub that has been modernised. 3 attentive and efficient bar staff kept the drinkers topped up. 3 ales on the hand pumps, Fullers London Pride, Timothy Taylor Landlord and Truman's Swift......I opted for the Swift, decent and very enjoyable. Nothing remarkable decor wise but a very decent genuine London boozer....I won't leave it 18 years to I visit again.